Welcome back for a second action-packed episode, as we continue exploring changes to the FileMaker 11 internal SQL parser. We ended part 1 by looking at the INSERT/SELECT construction which, as you may recall, provides the SQL equivalent of a FileMaker “add new records” import from one table to another. Actually, when you use INSERT/SELECT, if you wish, the source and target tables can be the same table (or, rather, table occurrence), which once in a while can come in handy, and is something you cannot do via a regular FileMaker import. For that matter, you can also use INSERT/SELECT to map a single source field to multiple target fields, which is another thing a regular FileMaker import cannot do… but I digress. You can learn more about the CAST function here, or on pages 40-41 of the FileMaker 11 OBDC and JDBC Guide. Numeric field data can no longer be quoted. …because in FM 11 it’s the field type that determines whether or not a string of data is considered a number. For example, in FM 10 and earlier the following works, assuming “sales” is a number field. But in FM 11 it simply will not work until you remove the single quotes. Conversely, in FM 11, make the target field “zip”, which is (of course) a text field, and then not only can you quote the 99999, you must quote it because text field data must be quoted in FM 11. It doesn’t matter that you and I would consider 99999 to be a number — as far as the FM 11 SQL parser is concerned it’s just another text string. Not surprisingly, if you try the above example in FM 10 and earlier, you can quote the 99999 or not — either way it will work. Bottom line: in FM 11 the field type (text or number) determines quotes or no quotes. …returns a date such as 2011-11-30 (i.e., in the format YYYY-MM-DD). But when it comes to WHERE clauses, this composite view from the FMA 10 and FMA 11 data viewers shows the usual story of FM 11 being stricter than its predecessors. Well, if you’ve made it this far, and have also read part 1 in this series, you now know at least as much as I do about changes to the SQL parser in FM 11. If I were to attempt to characterize those changes in just a few words, I would say, “The SQL parser has become less forgiving — it’s more SQL-like, and less FileMaker-like.” However, this is the world we live in, and I’m grateful to have SQL as a tool in my FileMaker tool kit. I want to close with some good news for anyone who, like me, must support SQL not only in FM 11, but in various earlier versions of FM as well: if your SQL code is FM 11-compliant, it will be backward-compatible for FM 10 and earlier. This entry was posted in Level: Intermediate, SQL, Version: FM 11 or later and tagged FQL, Internal SQL on November 26, 2011 by Kevin Frank. Thanks for the insight. I just recently started using a SQL plugin. So it’s good to know what does and doesn’t work. Missed you on Friday night. Everyone must have been recovering. lol Hope to see you next week. Another concise and informative post. Thanks for your efforts. Nice post, Kevin. 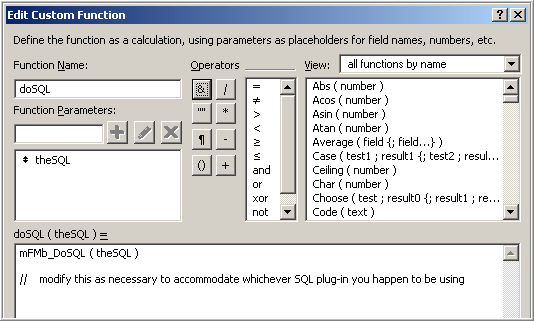 Thanks especially for clarifying FMP11’s SQL date handling and the reminder about FMP11’s treatment of NULL values. Good stuff! How do you insert Get ( CurrentTime ) into a FileMaker Time field using SQL? VALUES ( TIME ' " & Get(CurrentTime) & " ' ) "
…where “reminders” is the name of your table. I always use this construction for inserting/updating SQL times: TIME '14:35:10'… and SQL doesn’t mind extra white space as per my example, which hopefully makes things a bit easier to read than they otherwise would be. WHERE id_contact = 60546 "